I’m a person who lives in the current moment and cherishes it. After a lot of work and a lot of patience, I’m as content as I’ve ever been in my present day life – ridiculously, joyously head over heels in love, a secure home, a happy life. But there’s always a bit of an interesting tension playing out between past, present and future. You can’t hit middle age without the presence of memory making its way, swimming its way back to you. Sometimes it’s just a hint of something, a smell of fire evoking fall bonfires, or a song on the radio taking you back to a specific place and time. At other times, memory comes rushing back in an overwhelming flood. Last week, a student at my alma mater, my former high school, stabbed almost two dozen people. No one seems to know or understand why. But watching those familiar buildings on national TV was surreal. And it brought back some intense memory for me. I’ve talked about this before in this blog, here and here. I won’t repeat the details in depth here, but my experience at that school was, to be diplomatic, less than ideal. I was physically attacked for four years, several times a week if not every day. It was a war zone for me. Aside from one amazing fourth grade teacher who was always in my corner, I had precious few advocates who would speak for me. In my last year of school, the people who were accountable and could make changes were among the people joining in the teasing, taunting and bullying. I’ve got a great career now – a multi-faceted one. And in my work as a journalist, I always want to examine the whole story, to look for relationships and causes. It’s been so damn frustrating to watch this story and not have any real voice to ask questions, to wonder if everyone’s voice is being heard. It’s a huge lesson on how important the work of journalism is to the people whose stories are being told, one that I’ll never forget. The news organizations are not doing a bad job – not necessarily. They did wonderful work with the breaking news elements. But the Pittsburgh Post-Gazette ran an article this past Sunday, painting the town of Murrysville as a near-Garden of Eden, with Franklin a Shangri-La fouled seemingly for the first time by a dissenter, a bad seed emerging from the flock. They even used the term “near-perfect” in their headline. But no mention of the conflict that’s always existed between affluent Murrysville, middle-class Delmont, and working class (and sometimes quite poor) Export, where coal mines were operating a century ago. That’s fueled at least some of the conflict that’s happened here over the years. I know my personal story is just that – personal. It’s not enough to build a narrative around. I’m just one person, after all, and though my perspective is valid, one person’s experience does not make a trend, or a pathology. But news outlets have also missed a more recent case of conflict, one with perhaps a more viable source of verification. 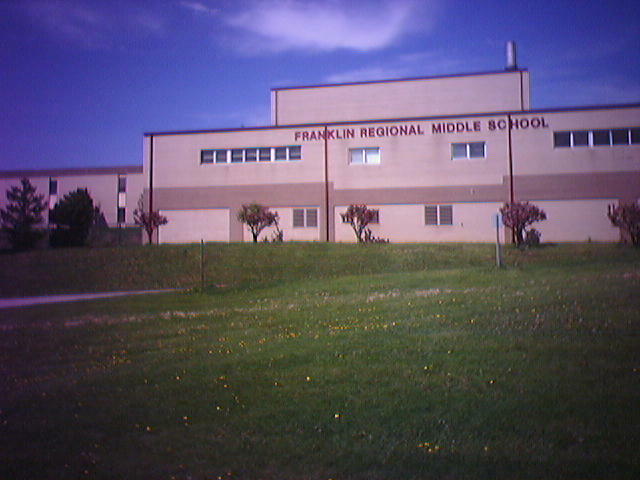 ABC’s “20/20” visited Franklin Regional in the late 1990s (1997, I believe) and featured a story where four young female students were having a fight. The two victims were suspended, while the two instigators remained in school. Even a decade after I’d left, the ability to resolve conflict and mediate those kinds of issues within the walls of that institution were called into question. Last week’s event is SO not about me. I know that. But it’s impossible to wipe my own experience out of my head, and look at it through any other eyes but my own, my perceptions shaded by experience. I’ve shared my concerns about school safety with every horrifying, sad event that has happened here in our country, ever since Columbine. I’ve had the same reaction each time. What drove this kid to do what he did? Mental health issues? Bullying? No one seems to know. And while I am deeply sad and horrified for everyone that he injured, and agree he needs to be held responsible for his actions and answer for what he did, I can’t help but wonder about him. We may know very little about him, other than the fact that he’s been described as ‘quiet.’ But the obvious piece that leapt out at me was that no one stepped forward to say, “Hey, I was his friend.” He was likely navigating those halls on his own, with no advocate, no guidance. Those are rough roads to walk. Now watch what you say or they’ll be calling you a radical, a liberal, fanatical, criminal. Sometimes, trying to have a conversation about the complexities of an event like this does earn you a label. These events always bring the conflict over gun rights and criminal law to the forefront, dividing lines between liberal and conservative. We’re living in a world that is far more politically volatile than when I was in high school. The growth and plenty we enjoyed as kids has shrunk in size and magnitude. My whole hometown region shed its primary industry. The late Harold Lasswell once said that politics is “who gets what, when, and how.” And when things get less plentiful, people make lists, and divide into camps. I’m sure I fall into the liberal camp on many issues, while much of western Pennsylvania is a conservative area. But the mental health of teenagers, the importance of teaching them how to resolve conflict, to speak up for help? This transcends political beliefs and divides. It’s a complex issue and will require a complex set of responses. And one of the first ones will be parents deciding not to model those simple label “us vs them” reactions, and instead teaching children to allow the humanity of everyone around them to exist, rather than trying to make people disappear. The questions run so deep, for such a simple man. I’m an oddball. I’ve always been the salmon swimming upstream. I suppose it’s more socially acceptable, more righteous for my public face and career, to steal a term from Malcolm Gladwell and say that I’m an ‘outlier.’ I always have a perspective that seems to be in radical opposition to the thing everyone else is seeing. That might serve me better as an adult than it did as a child, but still, my eyes are elsewhere. I couldn’t do it. Not because I don’t support the school, or mourn the injured, or respect these fellow alumni and their pride. They’re all good people, with kind hearts. It’s my curse to think – perhaps overthink – these sorts of things. But I couldn’t do it. I was never really FR, you see. It was never really mine to call home. I could not raise the flag to celebrate a house that never welcomed me. And it’s the remaining question nagging at me about this young man, the one who picked up two knives and wanted to harm so many others, the one whose motives are a mystery. A line has forever been drawn by those knives, one of no return. And now his name, Alex Hribal, will be writ in history books. His name will be whispered in the prescription pickup line at Ferri’s Pharmacy, at the Cozy Inn between the clinking of draft beer glasses, at Pat Catan’s by housewives helping their sons and daughters with a school project. Those people all know they’re loved and supported, as a town, as a school – they’ve seen it in image after image on TV and in print. They are FR. The breach in the circle is closing as we speak, soon to be healed. But the question I can’t get out of my head: Was Alex Hribal ever FR? Is he FR now? Or has the transgressor been erased from memory? Was he ever one of us? Then again, what can you expect from an outlier like me? It’s a legitimate question to pose from out here, outside looking in. I know it sounds absurd – please tell me who I am.